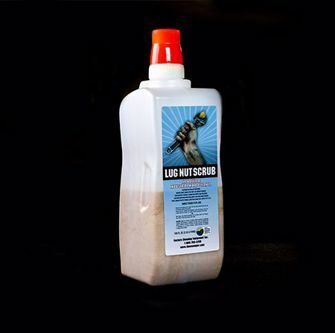 Lug Nut Scrub is an all-natural industrial hand cleaner that is great for hands that are continuously exposed to the elements of machine service and repair. It contains an antibacterial ingredient known as ‘PCMX’ that is fortified with supreme skin conditioners and biodegradable exfoliators. PCMX is also an effective deterrent to bacteria and fungi that is widely used in laboratories. There is no greasy residue left behind like other industrial hand scrubs. There are no dyes or fragrances either, just add water. The label and box use 100% post consumable material and even the bottle is composed of 30% recycled material! Lug Nut Scrub works wonders for people who are constantly working with greasy machinery. Don’t let the logo fool you, it is also great for everyday use at home. Everyone’s hands get dry and cracked in the winter, so having moisturizing exfoliating soap can be very beneficial for your skin.